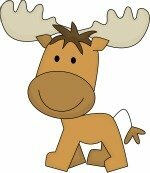 Aesops Fables are just short short stories that usually include talking animals. Most all fables also include a moral (which is a fancy word for a lesson). These fables are a fun way to teach us good lessons and show us how to make wise choices. 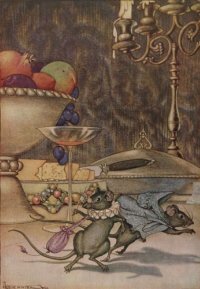 You can listen to the fables here or download them to your e Book Reader for free at Project Gutenberg. Aesop was a real man who lived a very long time ago! He was born into slavery in ancient Greece but he didn't let that stop him! Aesop was a very wise and smart man who used his head to not only gain his freedom but to even teach kings! Aesop's master was so impressed by his wit and intelligence that after awhile the master freed him. After this Aesop was given a position where he traveled around and told his animal fables to kings in order to teach them wisdom and how to get along with other kings and nations. Aesop didn't ever actually write any of his short fables down on paper. Many years after his death other people began to write the moral fables down as very short stories. We're sure glad they did because now we can take you on our next adventure! Remember, these are short short stories so you won't need to pack much, just a light snack will do. Ready? Get started by clicking any of the underlined links on this page. 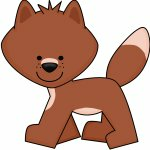 Do you like foxes? Have you noticed how in most short stories foxes are sneaky and sly? Click here to go on a fox adventure with us through Aesops Fables. We love dogs and cats, don't you? Click here to go with us on some of Aesop's dog and cat adventures like the Dog and His Reflection. It's about a dog who was being very selfish, meet him by clicking here. 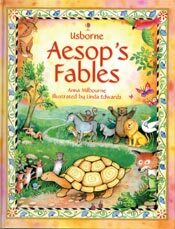 If you can't get enough of Aesops Fables we found these books filled with beautiful pictures! Our favorite is The Lion and the Mouse, Picture Book. It's a Caldecott Medal book.